Five pitchers and three judges attended the event. The winner, Jill Johnson, is in the centre. NeoThermal Energy from Halifax won a $500 Visa gift card at Volta Labs’ Women Taking Over the World with Tech pitching competition on Tuesday. The event saw five early-stage female-led tech companies present at the Volta offices on Barrington street. 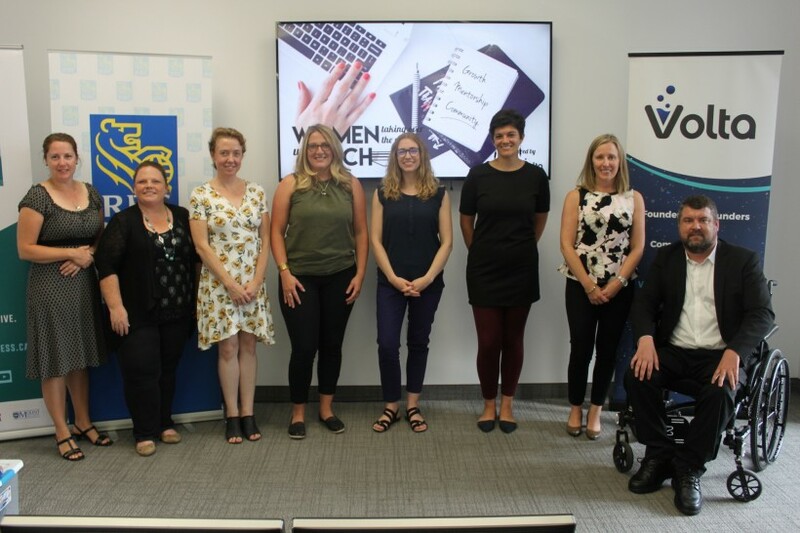 The original plan was for the first-place winner to take home a one-year membership to the Centre for Women and Business but before the pitches, it was revealed that all five of the companies are welcome to join the centre. This was the first pitching competition staged at Volta by WTWT. It was similar to Volta’s quarterly pitching session, where anyone can apply and win a $500 Visa gift card, but Tuesday’s event was only open to female founders. NeoThermal is a clean-tech company that has developed a heat storing electrical unit to help homeowners manage their energy consumption. The company has conducted two product tests, one in a private home and the other in a lab at the Nova Scotia Community College campus in Middleton. Jill Johnson, the Co-Founder of NeoThermal, presented to a panel of three judges, which included Stephanie Holmes-Winton, the CEO CacheFlow, Michael Sanderson, the Acting Director of the Sobey School of Business Development Centre and Lorie McCarthy, a commercial account manager with RBC. The other four companies that presented were Greylit, an online publishing company for front-line health research and publications, Quantum Link, which is building an app to link community members with local merchants, Amplify, an online publication that shares the stories of women in business, and OnBook, a software-as-a-service program which aids large organizations in onboarding freelancers and new employees. “Virtually every single one of these pitches had something to do with solving a social problem and that’s something that tends to be women-centric in a way,” said Ritchie. Organizers hope to make a female-focused pitching competition an annual event to encourage more women into tech and entrepreneurship. Just last month, WTWT organized a female-focused workshop on angel investing.